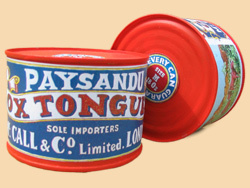 The classic, period, imported "Paysandu" Ox tongue label by McCall & Co of London. Produce of Uruguay, Paysandu being a shipping port on the Rio Uruguay upriver of Fray Bentos. Wrap-round and lid labels for this red-paint protected can.